This new LED LUX meter with 3 ¾ digit LCD display (max. 3999) is a high-tech instrument that is suitable for the measurement of the illuminance of LED lights, fluorescent or conventional incandescent lamps with different light colors. The measurement is performed in lux (lx) or footcandles (fc) or candela (cd). Simple Luxmeters are usually only suitable for the measurement of standard lights of incandescent lamps with a color temperature of 2856 K and show inaccurate measurement results for different color temperatures. 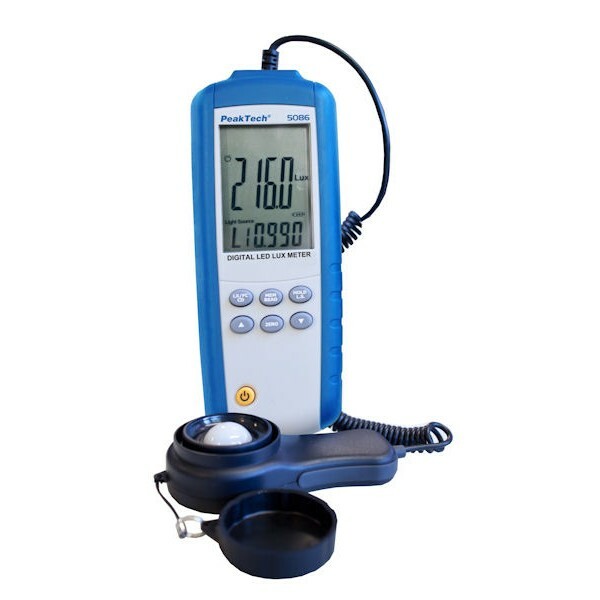 In the other hand, the PeakTech 5086 can be adjusted to various light source factors to measure for example various fluorescent lamps, tungsten lamps, red, blue, yellow or day white light LEDs. The unit has 10 free adjustable correction factors for different types of lighting, 99 memory places for readings and other practicable measurement functions, such as a minimum and maximum value function or data hold, making it ideal suitable for professional use in the work safety or the evaluation of various lighting systems.